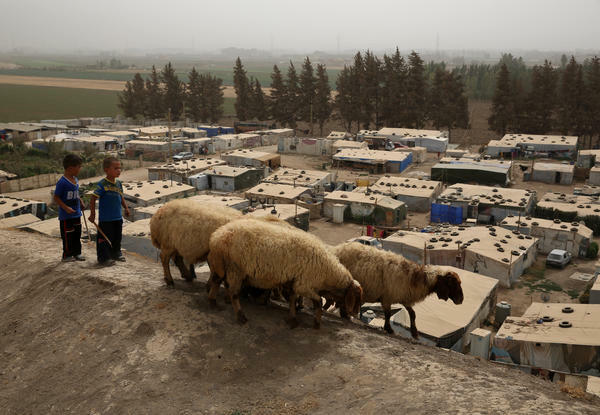 Syrian boys herd sheep near a refugee camp in Lebanon's Bekaa Valley. The Middle East is bursting at the seams from the Syrian refugee crisis. When I was in Lebanon's Beqaa Valley a few months ago, tension was mounting between the locals and the tens of thousands of Syrian refugees who've flooded into the area. Officials in one town were threatening to evict hundreds of Syrians living in a squalid camp in a muddy lot. Schools have been overwhelmed by Syrian students. The Lebanese overall have been welcoming but with no end in sight to the Syrian war many Lebanese were starting to complain that Syrian laborers are driving down wages and driving up housing prices. And now the situation could get even worse. In the wake of the terror attacks in Paris and Beirut, there've been calls to bar refugees from Europe and the U.S. The concerns were prompted by some early reports indicating that at least one the attackers in Paris may have entered Europe by posing as a refugee. Humanitarian aid groups say blocking refugees could be disastrous. "The host countries of Lebanon, Jordan and Turkey, they're already at the breaking point," says Brian Hansford, a spokesman for the U.N.'s High Commissioner for Refugees office in Washington. Turkey is hosting nearly 2 million officially registered Syrian refugees. Lebanon has taken in 1.2 million. Jordan is housing more than 600,000 and says it's spent $6.6 billion to process, feed and house the Syrians since the crisis began in 2011. "One in four people in Lebanon now is a refugee," Hansford says. "The infrastructure to deal with this influx is now pushed to its breaking point." According to the U.N. refugee agency another 7.6 million people are displaced in Syria. Many may end up fleeing their country altogether. Hansford says the world has a legal obligation, under the U.N. Convention and Protocol on Refugees, ]and his agency is very concerned about calls to block their movements. "This is not a Greek problem. This is not a French problem. This is not a U.S. problem," he says. "This is a global problem." He stresses that the burden of this global crisis should not fall just on Syria's neighbors. Legislation introduced by Republican Sen. Rand Paul, however, could block plans for the U.S. to take in 10,000 Syrian refugees over the next year. Paul says there needs to be a more vigorous screening of refugees to make sure none of them are coming, "to do us harm." There have been similar calls in some European countries to block any more refugees from entering the E.U. President Obama has threatened to veto a House bill that would intensify screenings of refugees from Iraq and Syria. The director of migration policy for U.S. Conference of Catholic Bishops, Kevin Appleby, Tuesday lashed out at what he called the scapegoating of refugees. "The vast majority (of refugees) are vulnerable families, women, children, elderly and they're fleeing for their lives," Appleby said. "They want what Americans want — protection for their children and a chance to live in safety. "Chris Skopec with the International Medical Corps worries that a political backlash against migrants could make it much harder to provide aid to the millions of displaced Syrians. "I mean it's been an uphill struggle even before this week to bring attention to their plight and to be able to provide the basics humanitarian services and protection that they're guaranteed by international humanitarian law. So indeed we are concerned." Even if the U.S. or Europe bars migrants, Skopec says, Syrians are going to continue to flee barrel bombs and fighting at home. "They're going to go somewhere. They will continue to increase in numbers in Turkey Jordan that Lebanon where absorption capacity has already been reached and exceeded," he says. "The ability for those countries and those populations to continue to show hospitality to accept them as refugees and provide them with basic services is being exceeded at this point and the overflow in to Europe is a result of that. We simply can't turn a blind eye to what's been happening over the past four years."